Pink Lemon Twist: One Seam, Sewn. All of the pieces of October Frost are blocked and dried, so now I can begin sewing them together. 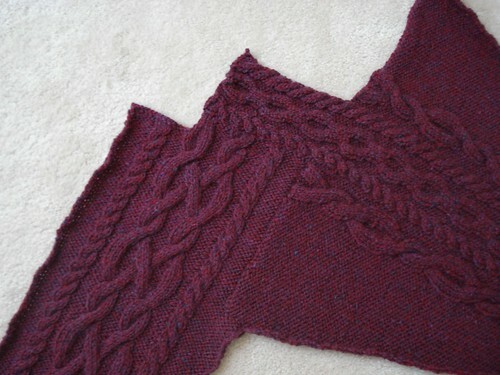 This is the first saddle shouldered sweater I've done, but I don't think it's going to be hard to sew up. On the left is the left front and the left sleeve is on the right of the picture. I have to sew this same kind of seam up 3 more times, then it's just a matter of side seams and sleeve seams before I do the front bands and the collar. I may take a couple of days to sew this sweater together just to make sure I get the seams all smooth and flat. I'm really excited about wearing this sweater this fall - I think it's going to be great! It looks great! It's going to be a stunning sweater.